Moving off uphill needs more power to prevent the engine stalling. It is vital not to let the car roll backwards which could be dangerous if there is anything behind you. Hill start with the parking brake. Set the gas. You will need a little more gas here as the car will need the extra power to set off up the hill. Find the bite. Find the biting point a little further up so that the car 'sits down'. This means that the car will lift a little at the front and sit down a little at the back. At this point it is very important to keep your feet still, if you lift the clutch up anymore you could stall. After releasing the parking brake, squeeze the gas and feed the clutch up slowly. Keep squeezing the gas for the extra power. Hill start without the parking brake. This is where you would just use your feet and not the parking brake. For example at a giveway junction where you are not waiting. Keep your foot on the brake, to prevent you from rolling back. Find the bite. You will hear the car engine drop lower in pitch. Again it is important here to keep your feet still. Come off the brake but keep your clutch still, again this will help prevent you from rolling back. Squeeze the gas, again a little more for the power, and feed the clutch up slowly. The main thing with a hill start is to concentrate on moving away and not whats behind you. Remember you will need extra speed before chaning up a gear. 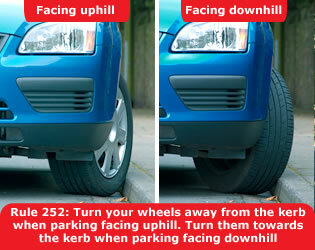 You should park with the wheels facing away from the kerb. If the vehicle rolls backwards, the front wheels will be stopped by the kerb. If there is no kerb, leave your steering wheel turned to the verge. If the vehicle rolls back it won't roll across the road. Leave the vehicle in first gear with the parking brake firmly applied.